Think of high tea and notions of polished silverware, multi-tiered cake stands and a formal atmosphere comes to mind. 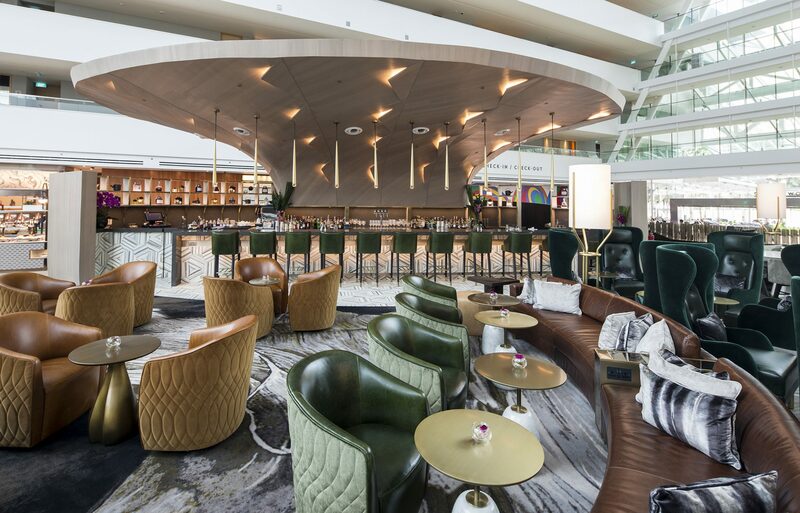 Not at Renku Bar & Lounge — a new space at the lobby of Marina Bay Sands Hotel. 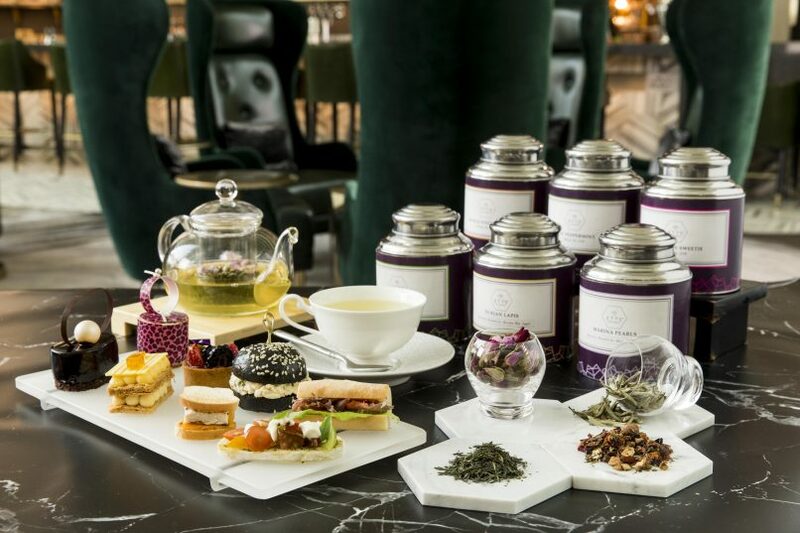 The high tea experience here has stripped off its stiff upper lip and elevated into a chic frontier where the vibe is glamorously relaxed and delicious morsels are served up with an exquisite selection of teas. The experience starts from the very entrance where wooden panels curve dramatically into a short flight of steps and opens into a visually stunning space. Here, leather couches, plush cushions and velvet bottlegreen wingback chairs are generously spaced apart, offering ample breathing space and comfort for the weary. Indeed, instead of being in an enclosed lounge space much like in many other hotels, Renku is nestled at the first floor of Marina Bay Sands hotel and benefits from the naturally lit surrounds with a ceiling that soars high above. The wooden panels that surround the lounge creates a sense of privacy and escape from the usual buzz of the reception area. Food-wise, expect a selection of gourmet bites and intricately created desserts. Expect a rotating menu with moreish sandwiches like prawn avocado with tobiko aioli as well as tomato and burrata with macadamia pesto. Those with a sweet tooth meanwhile can indulge in the luscious dark chocolate majestic cake or citrusy offerings like the lemon calamansi meringue tart. None of these are served on the multi-tiered stands that high teas are so known for. Instead, Renku Bar & Lounge presents these treats on a gueridon trolley coupled with heartfelt tableside service as the core of the experience. It is here that the establishment truly sets itself apart from other high tea spots as it offers time with a professional tea master. 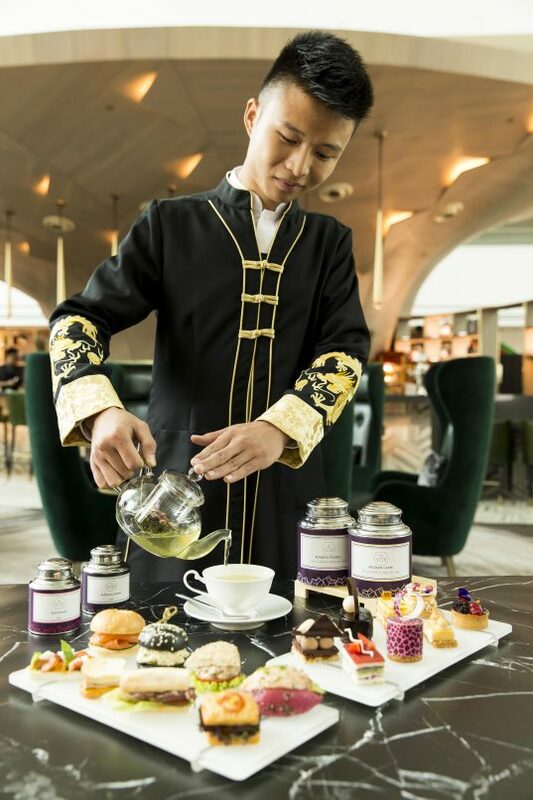 Instead of simply choosing various blends, guests can choose to customise their own tea by first picking the base of green, white or black tea and then pairing it with a variety of herbs and flowers at the guidance of the tea master. If experimenting with your own blend isn’t quite your cup of tea, then choose from a selection of over 13 flavours concocted by local tea makers Ette featuring bold combos like Nasi Lemak and Mango Sticky Rice. Renku’s signature high tea is available for two seatings daily at 2pm and 4pm. Visit www.marinabaysands.com/renku for more information.